Peggy Yu, COO of Startup Institute, knows access is the key. Get the latest updates on Take The Lead Day, a global day of action 11/14/17 to move women toward leadership parity across all sectors by 2025. See how you can get involved. Money talks and Lindsey Taylor Wood listens with a mission to fund female innovators. Meet Lisa Pearson, CEO of Umbel, who plans to level the playing field for women. 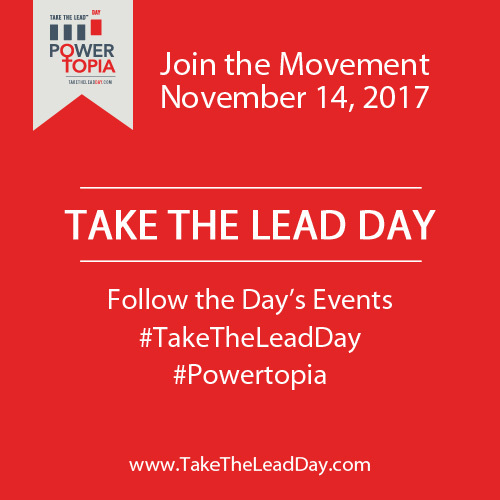 For Take The Lead Day November 14 with the theme Powertopia, consider becoming a change-maker yourself and host an event or watch party of the livestream from our NYC hub. You’ll find everything you need to get started here on our website with all the supporting tools to promote here. Our future depends on the health and safety of the girls in the world today. Take The Lead Co-founder and President Feldt embraces her power. Author and journo Jessica Bennett just named Gender Editor at NYT. Stay tuned. Politics is rampant with sexism. Surprise! The women at Amazon won an amazing victory on paid leave. Know the signs of a toxic work culture before you take the job. A token female in leadership is not enough to say you are diverse and inclusive. The reasons black women executives are not given a chance are many, Mellody Hobson says. As our friend and partner in parity, Gloria Steinem has boldly said, "The future depends entirely on what each of us does every day. A movement is only people moving."